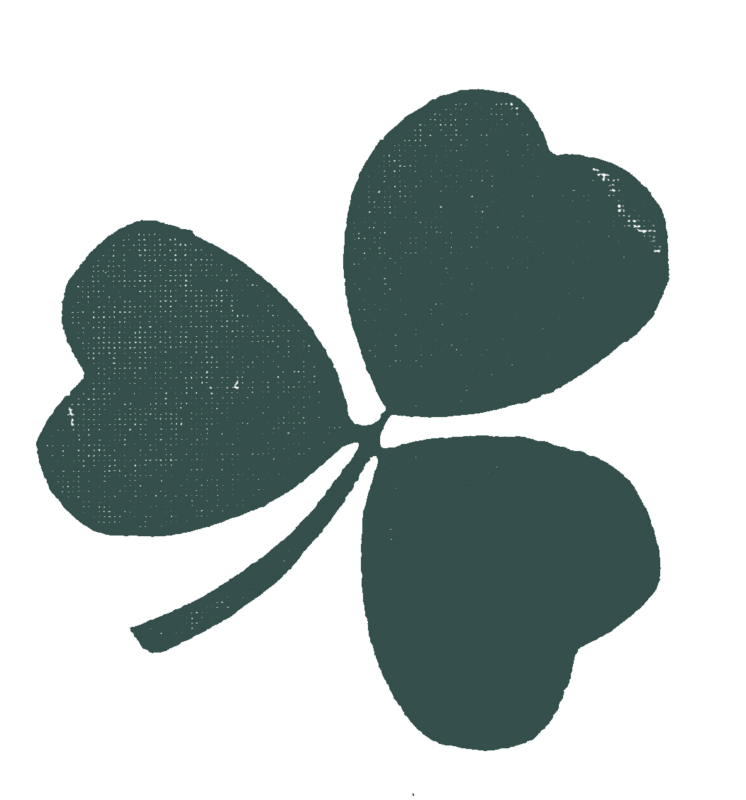 Blessings of Patrick’s Festival Upon You! As the Chicagoland book launch for The Peterson Pipe: The Story of Kapp & Peterson draws near, there are a few things I’d like to share in celebration. The first concerns Charles Peterson’s second Patent System (that’s right, there were two), the NAP. The NAP Patent System is the most intriguing unsolved mystery my co-author Gary Malmberg and I uncovered in the writing the book. 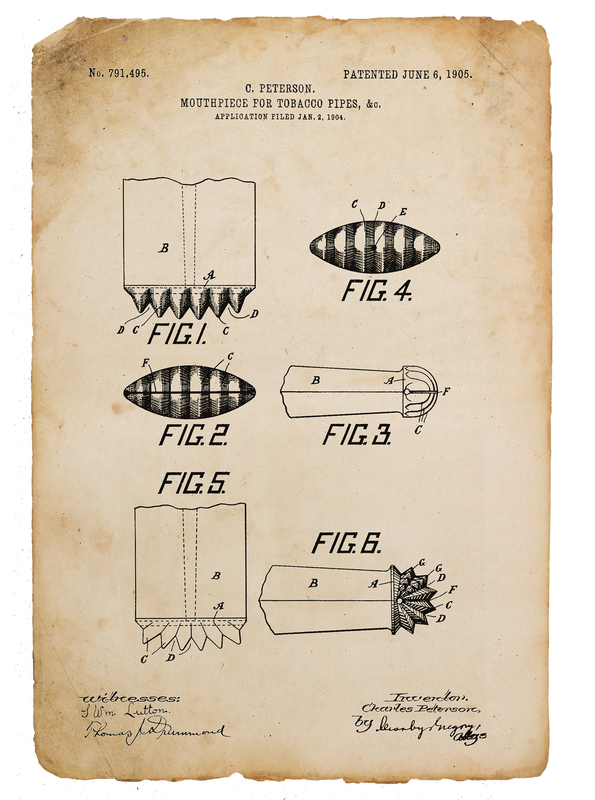 Even if no one else knows or remembers, Pete Geeks know that in 1898, Charles Peterson finalized the P-Lip Patent System. But what even many of them don’t know is that just six years later, on January 2nd, 1904, the inventor, artisan woodturner and entrepeneur applied for a new System mouthpiece patent, the “NAP,” which was granted eighteen months later and then advertised in the mammoth 1906 catalog. Gary and I had seen a NAP Patent at Sallynoggin in 2013, and in subsequent research Mario Lubinski provided photographs from his personal collection of vintage amber NAP mouthpieces. Overwhelmed by everything else we had to accomplish in our short research trip, the question nevertheless haunted us: Why did Charles Peterson pursue a second patent for his System? How did it smoke? Why didn’t the company pursue it? All we could do at the time was document our findings and move on. The word “NAP” in all caps, baffled us, but with other more pressing matters to contend with, we simply noted it and let it pass. Had we been to the race track, of course, we would have known. NAP comes from British (and Irish) horse-racing slang. 1 According to Wikipedia, “A tipster is someone who regularly provides information (tip) on the likely outcomes of sporting events . . . . A tip that is considered to be a racing certainty . . . is also called a nap [often capitalized as NAP] and tipsters in newspapers will tend to indicate the “nap.” . . . Nap (derived from the card game Napoleon) indicates this is the tipster’s most confident selection of the day.” Hence, when Charles Peterson named his new patent mouthpiece a “NAP,” he was saying in words his customers would understand that it was certain to be a winner. Peterson seems to have a spent a little time at the track himself, from one humorous cabinet photograph reproduced in The Peterson Pipe and preserved in Sallynoggin. In the photograph, he and his brother John are seated outdoors smoking their House pipes. A horse is seated (yes, seated on a chair) on the right, smoking his own House—or horse—pipe, with the legend KAPP & PETERSON running down the stem as it is being lit by Peterson’s lovely second wife Annie. Mario Lubinski also had a handful of full-length vintage amber mouthpieces mounted on mid-1980s Petersons. But as it was not possible for us to fly to Italy at that point and beg his permission to smoke them (right), we had to be content to simply report what we knew of it in the book. 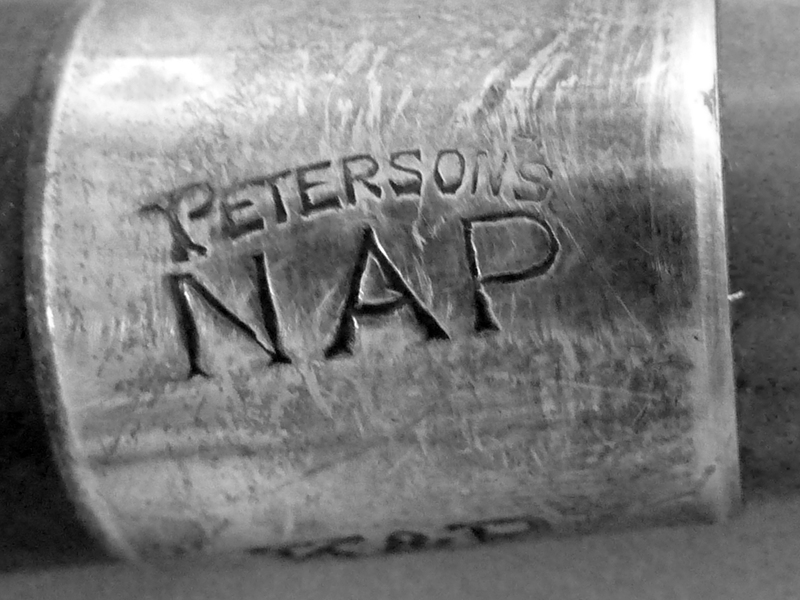 The existence of an IFS NAP System, hallmarked P for 1930-31, is not incontrovertible proof that the mouthpiece was still in production at that date, but given its wear, it is certainly possible it was original with the pipe. The NAP System is not mentioned in the 1937 catalog, but as the Depression was at its height and the catalog presented only selected shapes, it is quite possible the NAP was still in production. 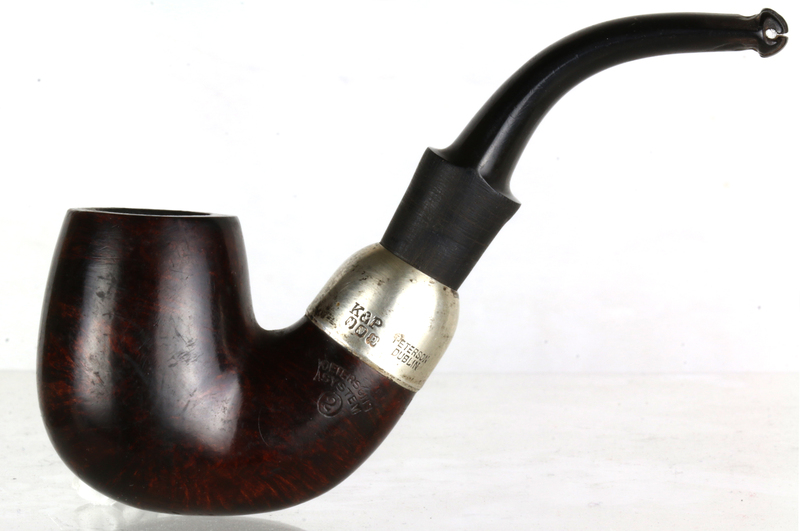 Gary’s 312 pipe, a 2nd Grade System, is described in that catalog as “a very substantial quality Briar with Hall marked Silver Mounts and fine quality Vulcanite mouthpiece.” The tenon of Gary’s NAP is in fact threaded for a missing “chimney” or tenon extension, as it should be for an IFS 2nd Grade System (what later would become the Premier). At last, we had a chance to try Charles Peterson’s invention for ourselves—doubtless the first to do so in the 21st century. Our preliminary findings suggest the NAP mouthpiece smokes quite differently from either a P-Lip or a traditional mouthpiece. 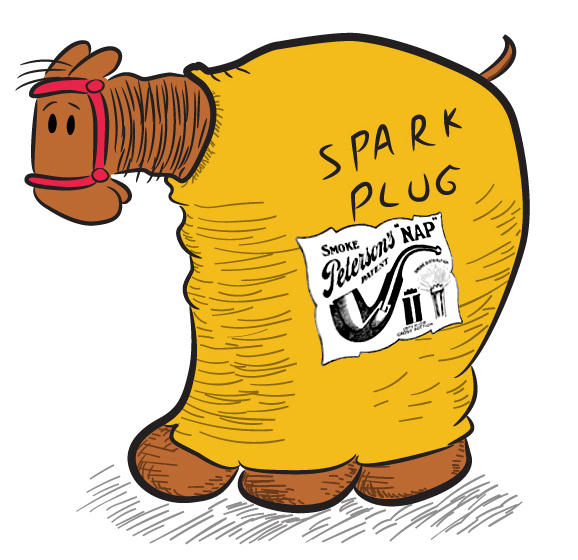 As the US patent document and the diagram in the 1906 catalog (seen on Sparkplug’s blanket above) show, smoke does not pass directly onto the tip of the tongue like a traditional mouthpiece. Nor does it pass above the tongue’s tip and across the palate like a P-Lip. Instead, smoke is drawn into the lateral vent cut in the button, then radiates from five points at 36º of separation, like spokes from a hub. 2 As I can attest from several trials with it, smoke is most noticeably first felt from the two side ports, then from the three central vertical ports made by the ridges of the button extending above and below the lateral vent. Like the original System, the NAP stem contains a graduated bore airhole with typical System drilling (1.5mm at the button to 5mm at the tenon). It was made by Charles Peterson to function with the existing Patent System reservoir as well. This means that it will smoke drier than traditional mouthpieces, as it does not collect moisture during smoking, which is instead deposited in the System reservoir. 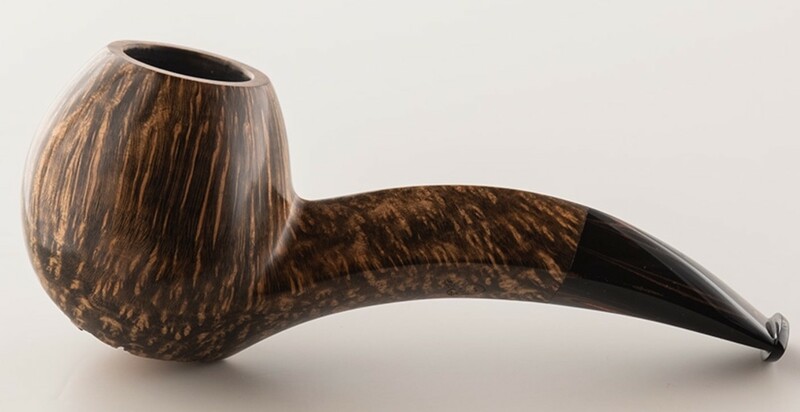 The NAP is, as may be inferred from Gary’s experience, a significantly easier draw than the P-Lip, and because the smoke radiates, seems by design to be made for sipping. But because of its radial distribution, the smoke has a softer, richer feel and taste than the P-Lip. 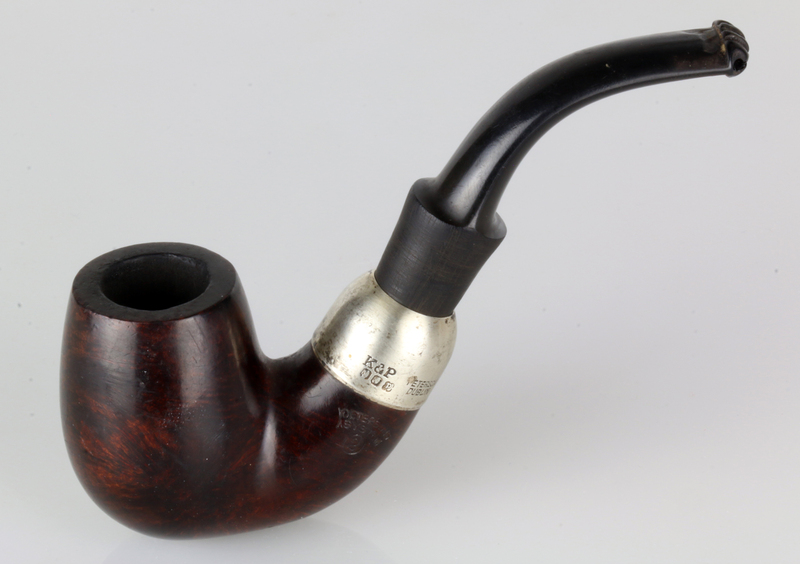 While smoking cadences vary according to the smoker, as a rule of thumb the P-Lip may be said to command a longer draught-like pull than the soft sipping typical of a well-channeled artisan mouthpiece. In contradistinction, the NAP combines the dryness and full flavor profile of the P-Lip with the easy sipping of a well-made fishtail, yet adds a uniquely soft and lush Mundgefühl or mouth-feel, as beer and wine aficionados might say. The mouthpiece must be cleaned by passing the pipe cleaner through the tenon-end and out to the button. It won’t pass through the “jaws” of the lateral opening, but this area is easily cleaned by passing the cleaner through it. In conclusion, our experience with the mouthpiece has been so positive that we believe it warrants further study, and to this end have commissioned Silver Gray, one of great artisan pipe makers on the US scene, to make a few reproductions of it after the Chicagoland show. * With the cooperation of Peterson, who has graciously agreed to supply the bowls and tenon extensions, we’re in the planning stages of creating a focus or vetting group, comprised of a dozen or so pipe smokers with expertise from various parts of the hobby to see whether the NAP might indeed, be a boil-over (that’s a long shot winner for you non-horsey types). Stay Tuned for more on the NAP! I cannot, cannot get over the plateau on the bottom of the bowl and the organic way in which this entire composition grows out of it. It has what my friend Charles Mundungus calls a piercing beauty. You can check out Silver’s pipes here and here. 1 Kapp & Peterson goes a long way back with the ponies: Tony Whelan, Sr. told Dermot Ward that there was a time at the famous Listowel Races in Kerry when “every second fellow’d have a System pipe” (The Peterson Pipe, 146).